An FBI undercover program known as PATCON spent more than two years collecting intelligence on the Patriot movement, without producing a single conviction. Timothy McVeigh was in contact with members of the targeted groups at the time of the investigation, but those links escaped notice, even after the Oklahoma City bombing. The program and its connections to the bombing are the subject of a major new investigative report by J.M. Berger for Foreign Policy. PATCON will be examined in more detail in a forthcoming report by J.M. 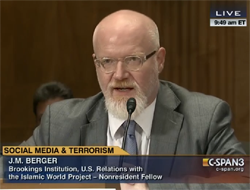 Berger for the New America Foundation, which looks at the double-edged sword of infiltration techniques and raises questions about how undercover agents and informants should be used in light of current controversies. Documents related to the case will be published on INTELWIRE in the weeks to come. For more investigating reporting on terrorism, check out J.M. Berger's new book, Jihad Joe: Americans Who Go to War in the Name of Islam, on sale everywhere.